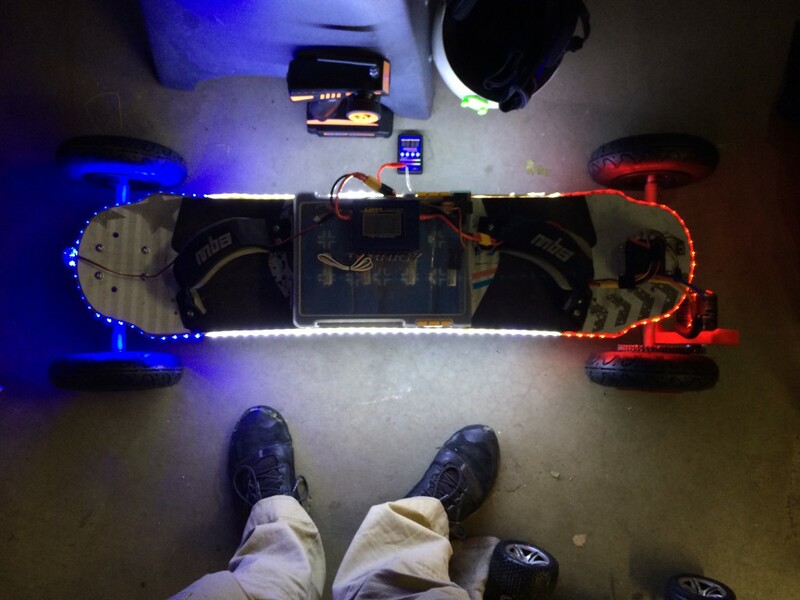 I’ve finally got my electric mountainboard up and running well. There have been lots of part revisions, lots of failures, and lots of learning. But this thing is sweet. Stock tires wore completely through after 10 miles of street riding (snow and ice in the mountains still). 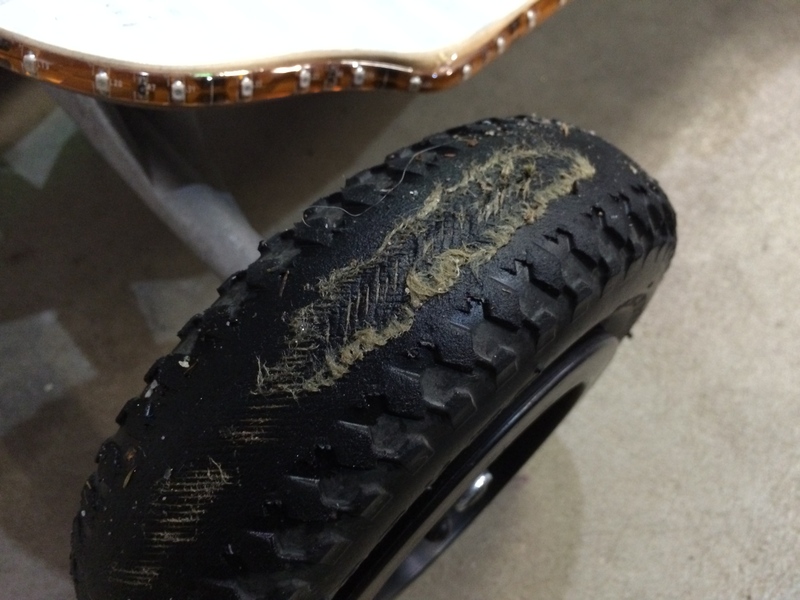 Fortunately the guys at MBS suggested I get Kenda tires and they’ve already got 20+ miles on them with no wear at all. 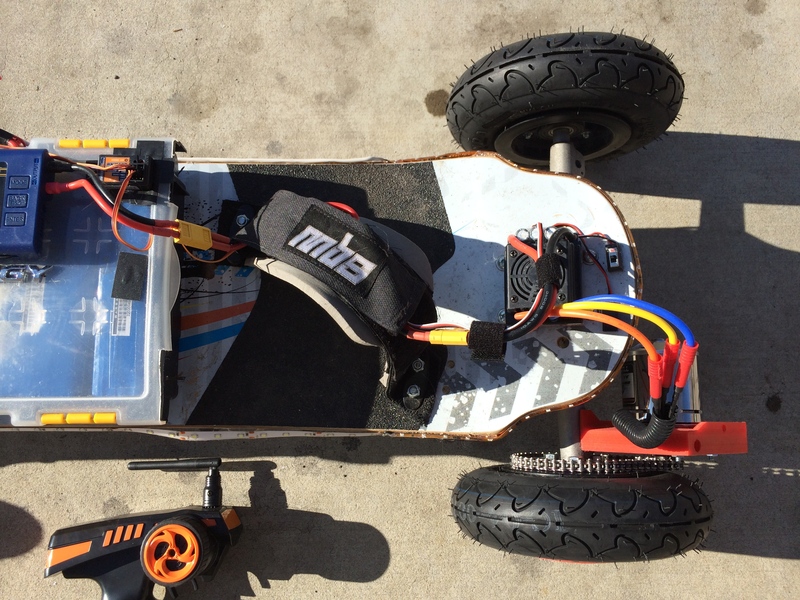 The top speed with my 6S LiFePo4 battery pack is 19-20 mph. With a 7S pack, I predict the top speed will be around 24 mph. 20 mph feels plenty fast to me though. With my 6S 16,800 mAh battery pack, I am getting around 10 miles of range (driving up and down hills as well as flat ground) to a charge. I haven’t been the full range yet because it’s freezing outside, but I have been 6.3 miles on 9.5 Ah of discharge so 10 miles should be a good number to go by. I’m pretty happy with how it goes together. 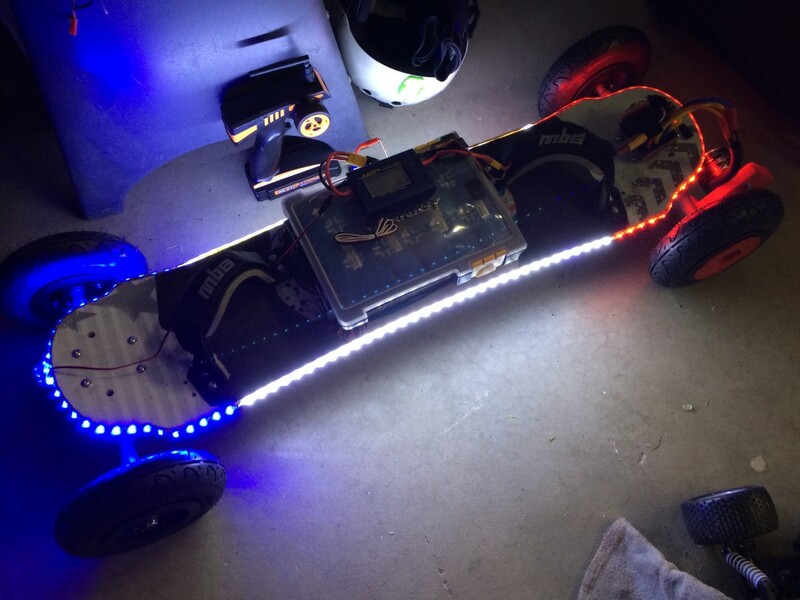 All of the parts just bolt on (except for the LED strips and the ESC which are just hot glued on) so it’s easy to add to an existing board, or take everything off if you don’t want it anymore. Makes it easy to service everything. It feels really nice to ride. Especially now that I changed to motor timing to high on the ESC. This gives much better acceleration. 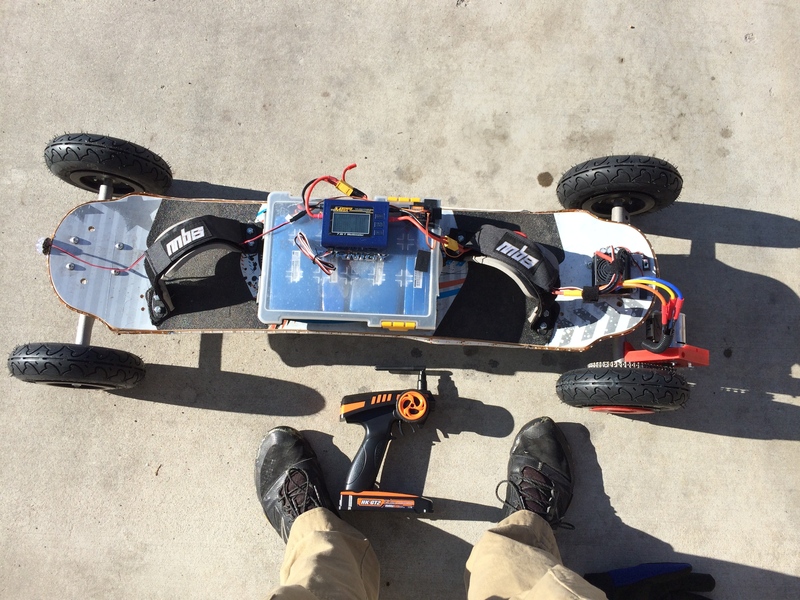 I still can’t get up real steep hills with just 1 motor, nor start from a complete stop (needs to be barely rolling for the ESC to function well). And I have to be pretty gentle on the gas otherwise the ESC loses sync with the motor and makes nasty noises. But now that I’ve ridden it a bit it works quite well. This thing if flipping sweet to ride. 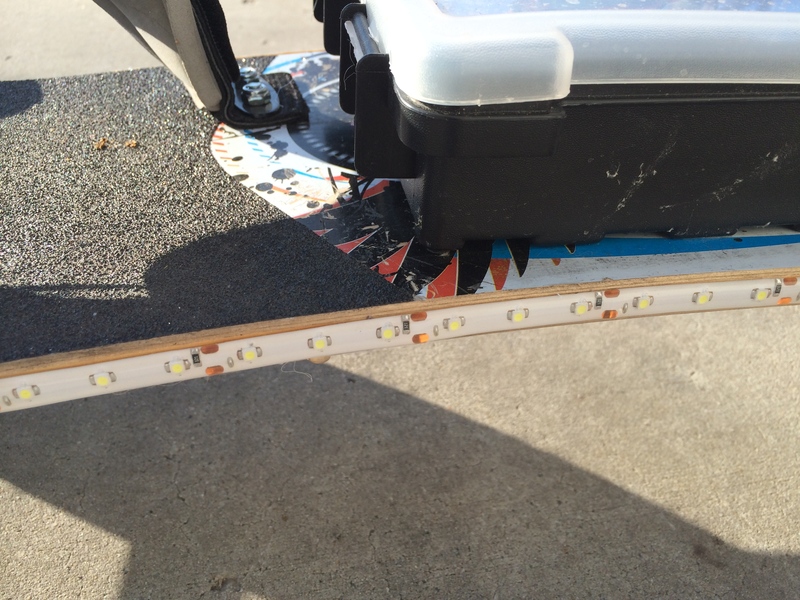 People are bamboozled when they see you riding a ‘skateboard’ uphill at night with sweet LEDs. I get about 45 minutes of continuous riding with my battery pack. 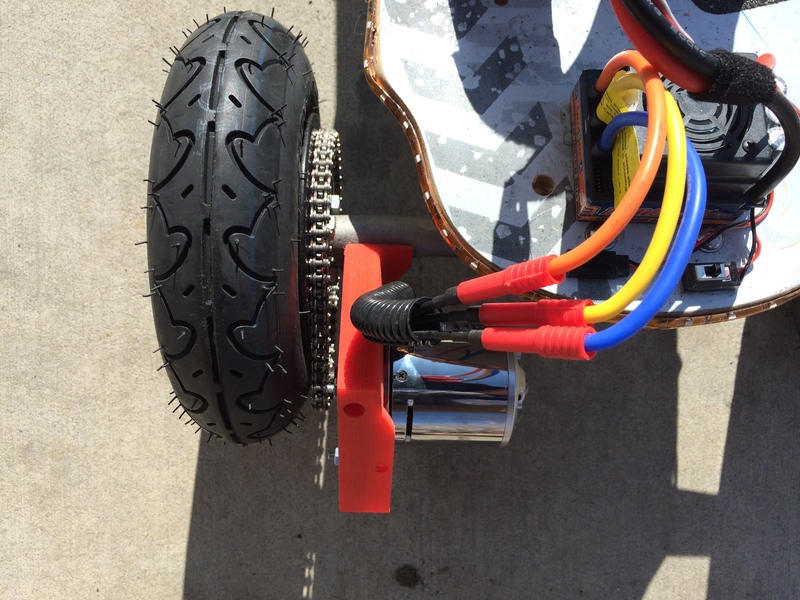 I would really like to add a second motor and ESC to the other rear wheel. 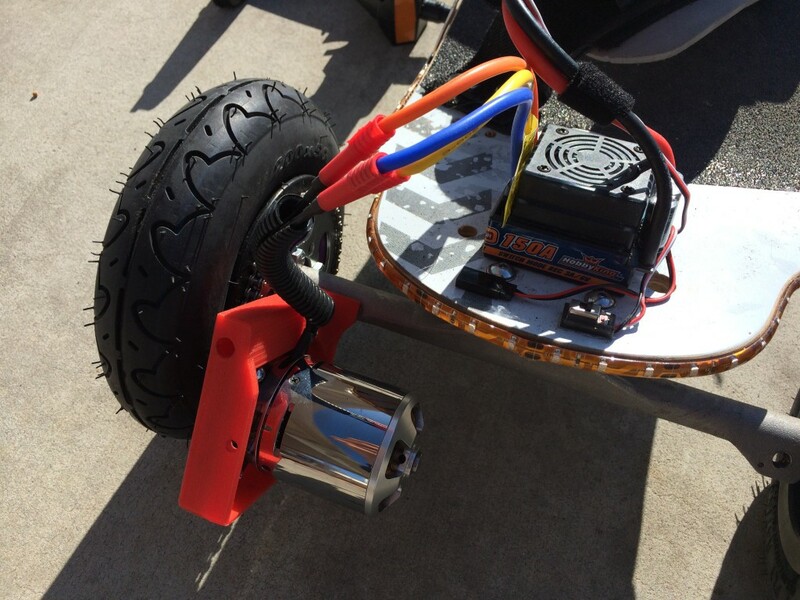 This would give awesome acceleration as well as decrease the load on the other motor. Would cost ~$150. 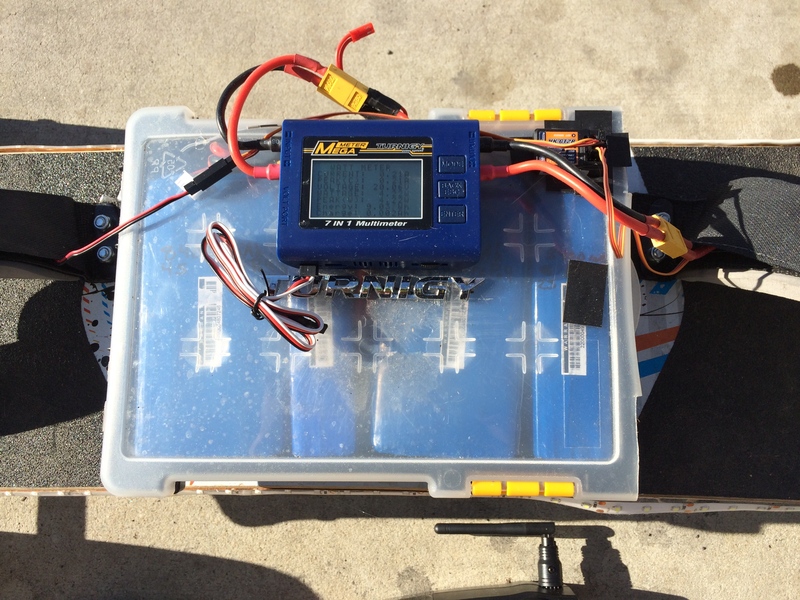 I have though about using 4 65 5000 mAh LiPo batteries (yielding a 20,000 mAh pack) to give me more range as well as being lighter. Would cost $200. Obviously the wiring could be improved. Maybe a slot in the board. Or a plastic sleeve to run through. Alien Power EV ESC. I’ve read a bit about these and they seem to have a lot more programming options. This could be nice, but not necessarily needed if I got a second motor. I’d like to build my own ESC at some point. An Open Source high current ESC would be sweet. Better charging. Currently I have to unplug the batteries from the harness and take them over to my charger. I would like to build my own charger that stays on the board so I could just plug in one plug and it charges away. Also, in regards to charging, the chargers I have are only 50W chargers. They should really be 100-200W chargers to charge the batteries as fast as they can handle it. Takes about two hours to charge with just the 50W chargers. Remote control. Tons of options here. Smaller would definitely be nicer. Get rid of the steering wheel. Have a deadman switch. You don’t need an AlienESC. 6S with 150A Car ESC and just add a second. Put 6S on each motor and you’ll have a beast. An AlienESC 12S is the same as (2) 6S w/ 2 motors. That’s false. A Dual Alien ESC is two 12S esc’s packaged together. They are wired in parallel so each controller and motor receives full battery voltage. How are your plastic mounts? Do you believe they will hold when riding rough? They are pretty nice. If I had access to a CNC I would definitely redesign them to be made in metal, but they work pretty nice for plastic. I’ve broke some of them hitting stuff hard, so I’ve made some improvements and I haven’t broken one in a while now. You need to go to Matrix trucks to lose the speed wobbles. I couldn’t get around the problem with those trucks, but the spring suspension fixes it nicely. 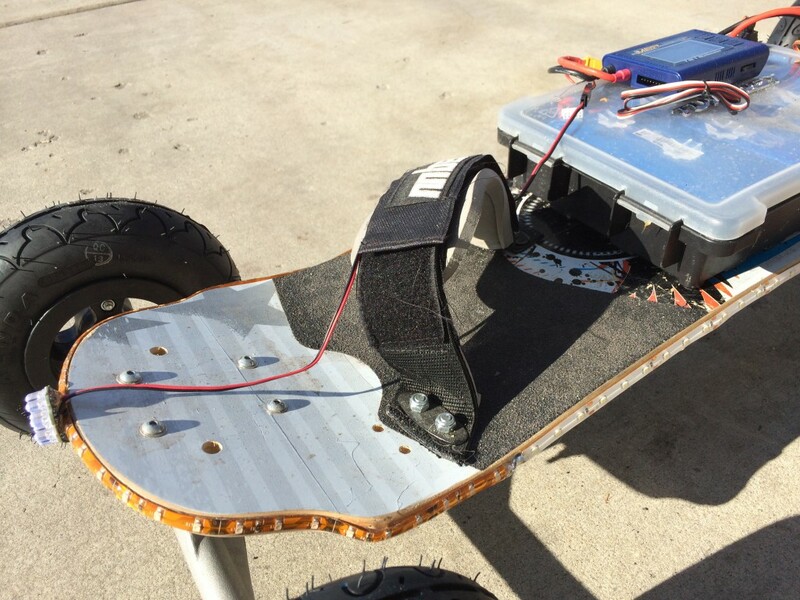 I’ve gone gas power and I can hit upward of 40 MPH and so long as your KNEES don’t wobble, the board is secure. The Comp 95 deck is also alot more stable. I don’t recommend going to the Pro model fiberglass deck. Too flimsy. The Comp 90 or 95 is best, but it will take some re-engineering of the motor mount for the square trucks. 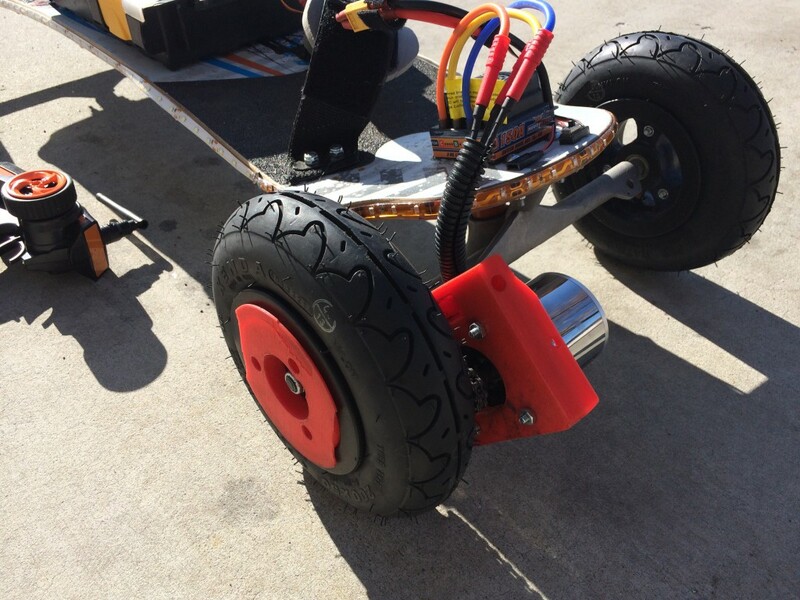 the wheels will change out with a bearing swap, as the twist hubs have no bolts for mounting the flywheel. I’m running the aluminum rims, but only for style. The are no better a ride than the plastic hubs. All in all, good build! I would certainly upgrade your board before you take it to the next level, though. Thank you for the info! That saves me tons of money in experimentation. Also- try the T-9 (?) tires. 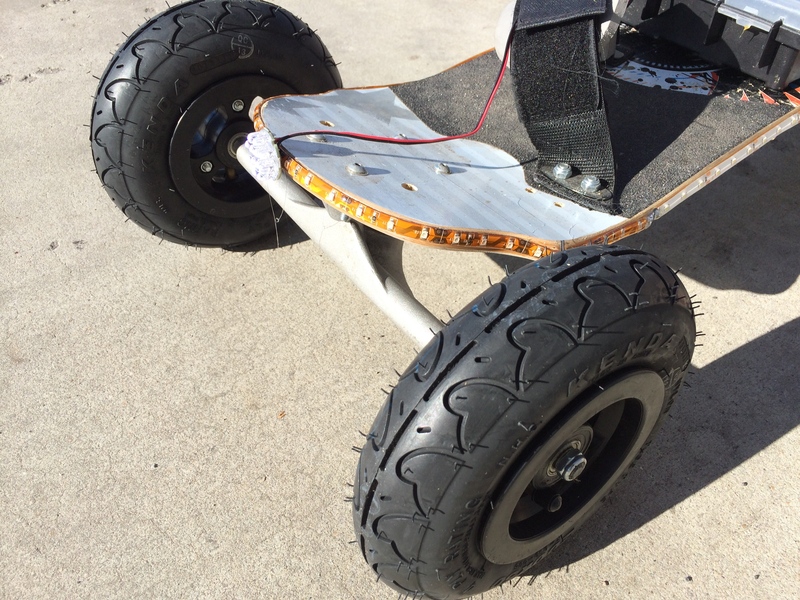 They are off-road tires with a continuous tread around the center. Lasts WAY longer than the street tires. One set can last me over a year! I was going thru a small FORTUNE in tires until I found these. I won’t do anything else anymore- just be sure to rotate the drive wheel often. Can you share a link. Google searching turned up empty. I was wondering how you found the motor mount after a few more miles? Is it strong enough being mounted using only 1 bolt? Have you found it twists or jumps around at all? WOuld love your feedback! Yes it twists. And it’s quite annoying. I think the easiest solution would be to add another motor + mount on the other side and then have a cross brace that keeps them from twisting. do you believe you really need that 150A ESC? or could you have gone with a 120A? Sorry for not responding. Been distracted. You could probably be just fine with a 120A. The max power pull I’ve seen is just over 1000W on my meter. So 50A on my system. Have you got a braking system integrated? I currently use the braking capabilities of the ESC. It works pretty well actually. I like that there is no added complexity or parts. Just pushing the trigger backwards on the remote is all that’s required. Pretty sweet. I’ve pretty much ordered all the parts you listed, but got two 65 5000mah batteries (room to add more), and got the 200w charger which were both obviously your suggestions. You mentioned several options for a remote control – what have you seen that might be smaller? Thanks for all the info! Basically the only other option I’ve seen for remotes is building one yourself. I had originally built a wired version with an Arduino and a thumb joystick. It was much smaller but the thumb joystick was awful. I also tried adding force sensor pads for each foot. Was a terrible experience because you have to worry about foot pressure while going up or down hill and turning instead of just pulling a trigger. All in all, I’m very happy with the hobbyking remote. Fits great in the hand and I’ve had zero problems. It’s really quite nice. A little big but I don’t even notice it in my hand. Hope this helps! And please post pics/details of your build! I would love to see it! Does the one ESC that you have operate both motors at once or do they have to be wired each with their own. I assume that if that is the case, they can both be operated with the same remote. I’ll definitely post pics of progress. Thanks. Actually, I think I know the answer and went ahead and ordered another ESC and another programming card. Yes 2 ESCs. I do remember reading though that you can’t just use a y connector on the cables to connect the two ESCs into your receiver. Because then you apparently have issues with the 5V BECs colliding. So you just cut the one 5V line from the 1 ESC as I understand it. Not really. The atom 90 only had bolt holes on the rear axle. Plus I’ve seen people do wheelies with rear wheel drive haha. My printed mounts fit through the atom 90 hubs so no drilling was required. You inspired me to order a second motor haha. Should be here tomorrow! thanks good contents. I’ve learned lots of things from you. Can I get 3D Medeling file(*.prt or *.sldprt) for make a revision for me? later I show you the things that I made a revision. Please share your changes when you are done! Hi, did you place a converter for the led lights or you just connected them to the 6S battery directly? I use a seperate 3S battery usually. Definitely room for improvement in this area though. Wonder if you ever fixed that ESC problem with the weird noise? Do you know what it is now? battery question for you mr.rocketman. I’ve found these on eBay. Will two of these be sufficient ? Never heard of the brand but by the numbers they should work great! 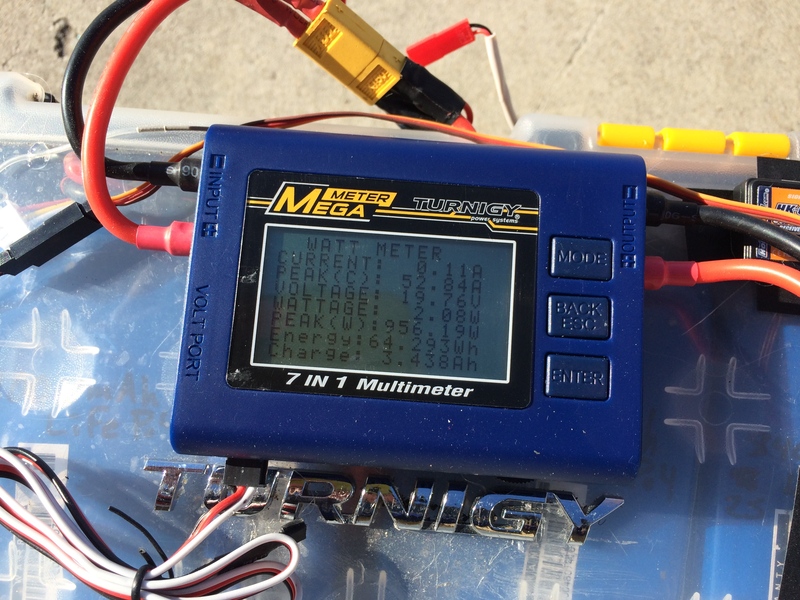 I am using the same motor, esc’s and meter. Hi mrrocketman! Great tutorial! Can you please do one your battery setup! Step by step or throw a link, the battery’s are confusing. Next Next post: New Riding Video!